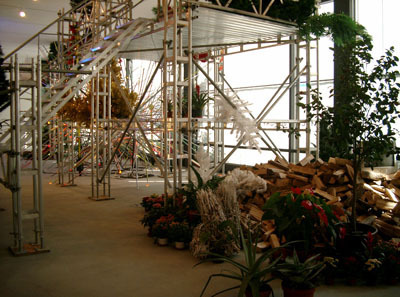 View of John Armleder, “Too Much Is Not Enough,” 2006–2007, Kunstverein Hannover, Germany, 2006. Q: What do you get when you cross flower-encircled scaffolding, abstract painting, fluorescent lights, mirrors, silver Christmas-tree limbs, stuffed animals, piles of coal, and disco balls? A: The first comprehensive show of Swiss Conceptualist John Armleder’s work in the United States, which is curated by Raphaela Platow and will include more than forty objects made since 1986—from gestural “Pour” and “Puddle” paintings to “Furniture Sculptures” (used furniture paired with abstract canvases) to installations (many created specially for the Rose), all set against his wallpaper-like designs—as it sprawls over the museum’s ten thousand feet of exhibition space. Once involved in Fluxus, and a founding member of the Groupe Écart, Armleder has been something of a polymath from the start. And here, at last, his vertiginous eclecticism will get its due.